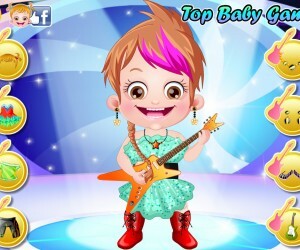 The Baby Hazel educational line of games is well-suited for girls in that it illustrates teachable real-life situations that girls face regularly. 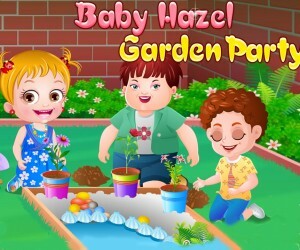 In order for players to advance to the next level of the game, each activity has to be completed in a timely manner or Baby Hazel will start to cry. There are four levels in “Baby Hazel Brushing Time”. With each successive level, the difficulty and challenge quotients both increase. Furthermore each level is timed; the faster that each activity is completed the more points and bonuses the player earns, so speed and concentration are crucial. Level 1: This level is about waking up Baby Hazel, which is one puzzle to solve. Hints as to what she wants are given in the thinking bubbles, letting players know what she wants by thinking about the specific item. She wants the rubber ducky, a ball, the crib entertainment center hanging above the crib, and a round noisemaker to wake her up; all are to be used in 1 minute and 30 seconds to earn points. Her happiness level is constantly measured and increases with the use of each toy. Level 2: Now that her mood is refreshed by waking up, the accessories for tooth brushing have to be selected. As accessories are picked, a tick mark is shown, illustrating that the correct item was chosen. There’s a board featuring 24 accessories; 8 items must be picked correctly to effectively solve this puzzle. The happiness level is shown through a smiling yellow-colored happy face. Level 3: The next puzzle is to help identify and place each accessory on each activity. There are 4 steps to the tooth brushing activity; each step is identified by picking a written task. Step 1: Brush teeth. Step 2: Clean tongue. Step 3: Massage gum. Step 4: Wash face. If the wrong step is chosen the baby shows confusion through her facial expression; this confusion is followed by crying. Educational. Practical. Lessons that last a lifetime. These are all hallmarks of the Baby Hazel games, which are quickly becoming the favorites of girls everywhere! Now it is Baby Hazel’s Brushing time. Good Morning! You need to Wake up Baby Hazel and convince her to Brush. Pick up the tools required for brushing, tongue cleaning, gum massaging and washing face. Help Baby Hazel to complete all brush time activities without making her cry. Complete the activities within less time to earn more points.